Put a smile on their face with this gift basket to celebrate their anniversary or birthday. With this basket, you’re sure to get it right. The basket features two teddy bears, delicious white chocolate squares and, to complete the perfect gift, a box of the famous Godiva Coeur Iconique with its most exquisite selection of heart-shaped white, milk and dark chocolate, the essence of Godiva. 1 box of Godiva Coeur chocolates: six hearts in classic white, milk and dark chocolate. 1 box of white Carrés Godiva: white chocolate. 100gr. 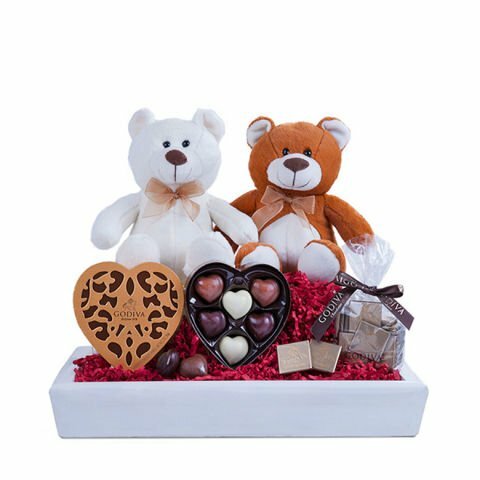 The basket features two teddy bears, delicious white chocolate squares and, to complete the perfect gift, a box of the famous Godiva Coeur Iconique.